Currently residing in Los Angeles, Frank was born and raised in San Francisco, CA. In 1976 Frank attended Berklee College of Music, studying woodwinds with Joseph Viola, Joe Allard, Steve Grossman and composition/arranging with Herb Pomeroy, Phil Wilson, and Greg Hopkins. He received a National Endowment Grant for the Arts in 1980 to compose a 90 minute continuous jazz/classical suite for large ensemble. 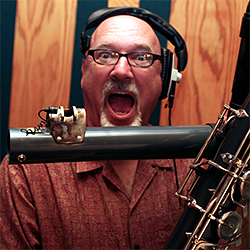 After graduating with a degree in composition, Frank taught at Berklee, as well as performed throughout the New England area with his 8-piece fusion group, ‘Booga-Booga’. In 1981 Frank moved back to the San Francisco area where he continued working as a musician and composer/arranger over the next ten years, performing concerts with such artists as Ella Fitzgerald, Rita Moreno, Tony Bennett, Clare Fischer, Chuck Mangione, and the Temptations. In 1991 Frank toured Germany performing in productions of West Side Story and 42nd Street, and then found himself in Los Angeles, where he has remained ever since. Since 1992 he has worked as a composer/orchestrator on many films and television projects, including Superman Returns, The Fantastic Four, X2-Xmen United, Men of Honor, I Am Number Four, Austin Powers:Goldmember, Santa Clause 2, and television shows Night Visions, Nickelodeon’s Oh Yeah Cartoons, Disney’s Oliver Twist, and the Tonight Show. From 1997-2001 he created a series of five original audio horror stories CDs entitled “Little Evil Things”. In 2003 he completed the jazz/world CD “The Galapagos Suite”, a six movement suite based on the animals of the Galapagos Islands, where he and his wife Tracy visited. His CD, “Animals” was released in Fall 2004, and the follow-up “Mo’ Animals” in Winter 2006, featuring Frank on multi-woodwinds and a roster of some of Los Angeles best musicians. His 2007 CD, “Emotions” featuring the Prague Orchestra and Frank on tenor sax, received a GRAMMY nomination for Best Instrumental Arrangement and was followed by another CD with the Prague Orchestra, “Landscapes“, also nominated for a GRAMMY in 2008. In Jan. 2010 Frank’s CD “Folk Songs for Jazzers” was released. It received a GRAMMY nomination for 2010. His new CD “Grease Mechanix” is available now, at his website: frankmacchia.net. All of Frank’s music is available on iTunes. Frank lives in Burbank, CA with his wife and son Charlie.